I used to love playing violin. I still do. December 7, 2016, 3:37 PM · Life can be difficult, when you love playing the violin. 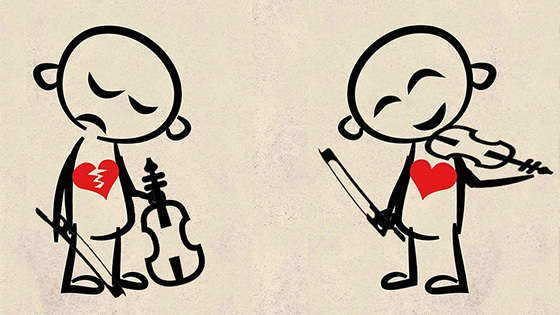 It can be downright discouraging, as a recent story by former Juilliard student Arianna Warsaw-Fan Rauch illustrates: I used to love playing violin. But mastering it broke my heart. I certainly have sympathy, even empathy, for Rauch's experiences: the "hours of tedious, obsessive nitpicking" that can shred the soul and kill musical enthusiasm. Training at the elite level is unforgiving and carries no guarantees. Keeping balanced in an environment of top-level expectations can be nearly impossible, particularly if you are matched with the wrong teacher. And it's not just at the top levels that this can set in; learning violin and playing it reasonably well require a unique level of precision at every phase, and this can be crazy-making. Just producing a reasonable-sounding noise on the instrument requires some serious coordination, not to mention issues of intonation, tone production, music-reading, memory, fluency, etc. It's one demanding instrument. And yet, I would argue that striving for mastery on the violin has actually strengthened my heart, not broken it. I see the same in my students. I'd even defend tedious and obsessive nitpicking -- as part of a healthy overall diet. There is a positive side to the deliberate, single-minded effort of perfecting a technique on the violin: achievement. More often than not, I've found that the "impossible" is actually possible on the violin. Striving for those goals has taught me that some things take more than a day's work to achieve; they can take a few days, or a week, or a month -- even years. But practice and persistence brings those goals ever closer, until one day you pass the mark and don't even realize you've reached a new level of mastery. Because with violin, there is always more, that is true. But I try to remind my students (and myself): "Do you remember when this was impossible? And you did it anyway?" I still remember one of my most frustrating moments with the violin -- I was in grade school, learning Seitz Concerto No. 2, III. Somehow the top of the last page was simply impossible. There was no way in the world that I would ever ever ever be able to play that. That seems almost comical, looking back. But I remember it, when a student playing "Go Tell Aunt Rhody" says with very real frustration, "This is impossible!" And I've remembered it for myself, when music like Schoenberg's "Verklarte Nacht" or something equally challenging has hit my desk. Yes, this seems impossible; yes, I will learn it. This faith in the process translates into other areas of life. Playing the violin has assured me that when things get difficult, it helps to make a plan and work it step-by-step. I used to love playing violin, and I still do, nearly 40 years later. Certainly I've overdosed at times; become too attached; gotten my ego too entangled in the endeavor. I've failed auditions, I've had to take a break here and there. I have not reached every goal, professionally, and I have not learned everything there is to learn about the violin. But at the end of the day, I still love playing the violin. It's taken me to some amazing musical places, and it has rewarded my devotion in ways that I never could have expected. December 7, 2016 at 11:19 PM · A lovely article. I am 65 and started lessons again after a 45 year break - learnt for about 8 years as a teenager. Now, I see things more clearly - my practice is more efficient and I have learnt that by focusing first on the basics that it comes together better. For example, tone production and good bowing. I often want to rush on to harder pieces to prove I am progressing and that carries enormous frustrations. I've learnt to do both is best. But the most important thing I now know is to enjoy playing and love your violin - no-one will ever be perfect but enjoy what you are doing. December 8, 2016 at 01:34 AM · A wonderful perspective and a nice antidote to Rauch's frustrating lament. Thank you. December 8, 2016 at 01:35 AM · Beautifully said. The violin teaches us life. Thank you for your uplifting experience. December 8, 2016 at 06:15 AM · Thank you for writing this! THIS is what music is all about! December 8, 2016 at 08:03 PM · I finally bothered reading the article- it was linked via a number of other sites I visit too, people seemed very moved by it for some reason. I wasn't. I suspect the writer would have had an issue no matter what career or interest she'd pursued: self absorbed and emotionally shallow, she finally gains fulfilment when she meets Stephan! Well, good luck to that relationship. Has she seriously managed decades of study without hearing the idea of putting the listener first, or is that something that only a 50 year old learner would know about? Dope. December 8, 2016 at 09:05 PM · Me too, Laurie.... not least because of your web site and a sense of belonging to a community of like-minded people. Thank you for past 8 years! December 8, 2016 at 10:56 PM · Sharelle, you may be right, or not. I am not my student's analyst or counselor; I can only guess what goes on in the background. These days I work with 11 to 14 year-old girls: an age which is certainly "self-absorbed" but quite defintely not "emotionally shallow"! I find their reactions utterly authentic and it is my absolute duty to offer respect and nurture at an age of fragile and risky transition from real childhood to real adulthood. I agree with everything that Laurie wrote (which happens rather often!) but for the age when things went "wrong" for Arianna, I feel we teachers have a tremendous responsability. December 8, 2016 at 11:31 PM · The whole topic is much bigger than learning how to play an instrument. Our culture pushes children to make life decisions at a very young age - and the parents aren't helping. Recently I was making a joke at our local Starbucks saying something about a pre-school having Pre-Law and Pre-Med curriculums and a woman in the line came over and wanted to know where that school is - she was very disappointed that I was making a joke as she was serious. As a late starter (almost 30) when I finally started lessons on the violin (that was 40 years ago) I realized that I was in this simply for my enjoyment. However, I met children who, while excellent musicians, were making career choices as pre-teens. In my professional life I met more than a few people who had made early decisions about their futures only to grow up to be disgruntled people. As one put it his 20 years of experience was one-years bad experience repeated 20 times. Learning an instrument or any skill has benefits for anyone. The ability to focus, organize your time, self-motivate, et cetera. Deciding on a career path too young can, and often does, lead to problems. Even the effervescent Nadia who used to exude joy at playing solo has turned to the baton over the solo career. At the same time Pearlman exudes joy every time he plays in public. Sometimes it works, sometimes it doesn't. The Youth Orchestra where I volunteer my services is planning its 60th anniversary celebration and we're following up on the young musicians who played over the years. The beautiful thing is that the majority still play an instrument but only three (so far) have music related professions. The roster includes Doctors, Lawyers, Politicians, Accountants, Business leaders, et cetera and that is how I think music should be seen. December 9, 2016 at 02:54 AM · Nice blog Laurie. It goes to show happiness is not so much defined by success or failure but how we choose to view things. A failure in one person's view might be bliss in the eyes of another. December 9, 2016 at 04:39 AM · You are welcome, and thank you, Rocky, I'm very happy to hear that V.com has been of help! December 9, 2016 at 04:55 PM · "But I try to remind my students (and myself): "Do you remember when this was impossible? And you did it anyway?" Great column and the above quote from it is so true! But to your point, I've been in a lot of achievement-focused environments, and my experience--only speaking for myself--is that achievement is overrated as a path to happiness. I find that relationships are much more important than achievement, especially as I get older. I felt that way at a gut level when I was younger too, but I didn't have much experience or skill in forming good relationships back then so it took a while for me to be able to understand how to live more in concert with those values. I've also not ever really had the experience that you describe, Laurie: "remember when this was impossible and you did it anyway?" I don't even really know what that means, at least not on a gut, or heart, level. I don't think I've ever said, "oh that's impossible," about something I really wanted to do. My challenges have been more about setting healthy boundaries and not trying to do too much. I do remember not knowing things and then learning them and then knowing them afterwards, but overall my memories of learning are much more impressionistic than that description, more of a feeling of a journey along an unknown path that becomes gradually known. The good teachers I've had have been good guides and fellow travelers on this journey. December 9, 2016 at 10:46 PM · The anonymous post above was from me; didn't realize I was not logged in when I posted it. December 10, 2016 at 03:23 AM · I'm a new member of this group, and am enjoying the blogs and archives. I've been away from the violin for 35+ years, but recently started learning again, taking it slow and methodical, using Mr. Fischer's "Basics" and a few other recommended books. I was never an impressive player, but I did just fine in high school orchestra. My goals: practice 60 minutes a day, focusing on good intonation and tone, and other techniques. If I get good enough, I'd like to check out my small town's volunteer symphony orchestra. My point, I suppose, is that I'm doing this for the challenge and for the joy of (re)learning to make music! December 10, 2016 at 04:05 PM · Wonderful article, Laurie! As someone who has had a Love / Not-so-much-love relationship with the violin throughout my life, I can truly relate to all perspectives on this topic. Ultimately, just as in life, the violin has a way of showing us seasons of desire, and ebb and flow of interest that is important to recognize. In recent years, I have become more engaged in the world of teaching, which naturally has led to my rediscovering works and sparking my interest in relearning or perfecting those gems. Thank you, as always, for your insightful writing! December 11, 2016 at 03:25 PM · Yes. If there's anything I know about learning, it's that you have to start from where you're actually at. Instruction, to have much effect, should be presented to meet students' interior contexts and conditions. You can ignore all that and hope they cope, but, that way, you miss many chances . . .
December 11, 2016 at 09:36 PM · Celine, if you practice 60 minutes a day, you should make very good progress! Peter, lovely to hear from you, and I like "seasons of desire" -- so true, I've found myself in so many different roles involving the violin, and at times been on fire to practice, at other times needed a long break. Brent, I really agree, it's not just knowing where a student is with their violin playing, but also with their "interior contexts and conditions" - well said. December 11, 2016 at 09:38 PM · Also, I can understand wanting to spell "Perlman" "Pearlman" -- the man is a gem!